Evite as filas e os tempos de espera ao visitar a Cidade do Vaticano neste passeio a pé guiado. Inclui atrações imperdíveis, como os Museus do Vaticano, a Capela Sistina e a obra de Michelangelo, além da Basílica de São Pedro. (Observe que a Capela e a Basílica de São Pedro mantêm um código de vestimenta rigoroso durante o ano todo.) Os participantes recebem fones de ouvido para ouvir claramente o guia e aproveitar a entrada rápida nos locais. The company fulfilling this tour is extremely strict as they have multiple tours leaving at the same time. They have zero tolerance for people coming late and charge you full price for 'rescheduling'. Our tour had about 24 people and several of them including us were reschedules coming from earlier or same time tours there was a group of friends who were scheduled to be in separate same time tours that had to reschedule... and PAY... to be a part of the same group. I am disappointed about this because it cost us twice as much and we missed the morning viewings of the Apartment and Raphael rooms. ALSO!!! read the fine print. You'll still have to pay the Vatican Museum entrance fee of 24 Euros/person when you get to the tour office. This makes this tour not worth it in my opinion since you essentially have to pay double of the advertised price--deceptive! Getting into the Vatican is difficult, we understand. But our group did about 40 minutes of waiting around while our guide was getting tickets for us after security. I noticed other groups coming and going much faster since their guide moved quicker and did not require the group to follow them to collect tickets then back to the entrance. We definitely wasted time. Our guide, Gerolamo was not good in English and unfortunately, his personality was unable to come out. It was not enjoyable to be led by him. His descriptions of things were very basic and he repeated himself a lot. He was unable to answer questions coming from the group about paintings or artwork of the museum or sistine chapel. We were pushed through the Sistine Chapel without stopping even though other groups were able to stay longer. I would not suggest this tour to another person and recommend people go in on their own, purchase the museum audio guide and do it at your own pace. The lines for prepaid individuals went just as fast as for tour groups in early July. Our tour guide was excellent, the knowledge she gave us was relevant and interesting. Many facts I did not know and if you don’t take a guided tour neither will you. This tour was reasonably priced and totally worth it! We showed up at the Tour Office walking distance from Vatican City 15-20 minutes before our tour began where we checked in and received our headphones. Our tour guide Laura was friendly, informative and energetic. This tour is comprehensive enough theoretically, one could spend days exploring the grounds for the time frame 3 hours and price. 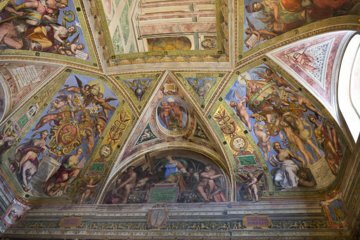 We saw important collections within the Vatican Museum, spent time at Sistine Chapel, and ended tour at St. Peter's Basilica. I highly recommend! Very kind and knowledgeable guide. Made our experience unforgettable. Well organized tour. We will recommend TOURS ABOUT to all our friends. Thanks for the amazing experience.